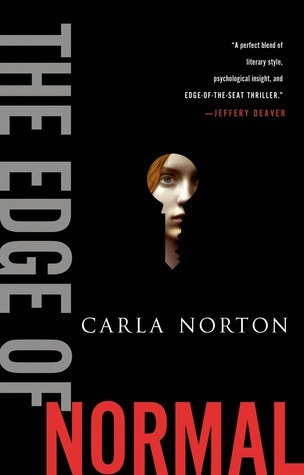 Today I'm featuring The Edge of Normal by Carla Norton, a psychological thriller that I borrowed from the library. Her name had been out of the headlines so long that he was sure no one was searching for her when he fit the key into the lock for the last time. Tuesdays are always a test, and getting to his office is the hard part, but twenty-two-year-old Reeve LeClaire has never told her psychiatrist about her route. It begins with a short walk to the Ferry Building, where she routinely orders a hot chocolate and carries it outside, sipping its sweetness while watching the ferries emerge from the fog. Page 56: "Reeve studies the tall young man, wondering—as she often does when meeting someone new—whether he knows who she is and what happened to her." My thoughts: I've been reading a lot of suspense novels lately because they fit nicely into my summer reading plan to tackle as many novels as possible during the hazy, hot, and humid weather. This one has me turning the pages at a feverish pace, and it was a nice surprise to discover that it's the first installment of the Reeve LeClaire series. The second book, What Doesn't Kill Her, which was published on June 30th, is also on my summer reading list. From Goodreads: In many ways, Reeve LeClaire looks like a typical twenty-two year old girl. She’s finally landed her own apartment, she waitresses to pay the bills, and she wishes she wasn’t so nervous around new people. She thinks of herself as agile, not skittish. As serious, not grim. But Reeve is anything but normal. From the author of the #1 non-fiction bestseller Perfect Victim: The True Story of the Girl in the Box comes a novel that draws you into a chilling and engrossing world. With masterful plot twists and shifting points of view that make it as irresistible as Gone Girl, Carla Norton's The Edge of Normal is a stunning debut thriller. Friday Focus: The Friday 56 & Book Beginnings #84 was originally published by Catherine for bookclublibrarian.com. This post cannot be republished without attribution. Retweeting and sharing on Google+ are encouraged and appreciated.